Want a quick and practical talk to add to your suite of safety and wellness initiatives? Our Program Tasters are the perfect solution. These stand-alone modules provide practical skills that can be immediately applied by staff to reduce pain and the chance of injury. Each taster program is fast, solution-focused and budget friendly. When we talk about workplace health and safety, we rarely think of our computers and desks being the culprits of causing harm. Safety talks for computer users rarely spring to mind for lunchbox wellness talks, but they should! Working Anywhere: This fun, interactive short talk introduces a few key work skills everyone needs to setup and work at a computer in any location. Preventing Neck Pain: Neck pain is very common among computer users. Discover the four, research-backed ways to recover from or minimise the chance of neck pain. Ideal Work Patterns: Discover the latest recommendations your staff should know about the work patterns that decrease discomfort and the chance of injury, both at work and after work? The session includes Professor Hedge’s 3S’s for an ideal work pattern. What makes workstation assessments effective? Simply setting up furniture and equipment for staff does not give them the skills to repeat that setup when they hot desk, work from home, or use tools beyond a screen, mouse and keyboard. Our workstation assessments and coaching equip staff with the ability to quickly adjust their own workspace to match their individual body size, job design and personal needs. These are repeatable skills they can apply to any workstation. Let’s work together to refine recommendations to your needs! In addition, we add a range of personalised recommendations designed to relieve current discomfort and reduce the chance of injury. Does your workstation assessment include skills that can be applied at any workstation? This is a personalised training session for managers, solopreneurs, writers, virtual assistants, and business owners who spend a lot of time on their computers. Intensely targeted, this session is held in your office and begins with a discussion about your job role, work tools and assessment of your workstation. We then work together to refine your immediate work environment, workstation ergonomics and work routines to match your job role and personal needs. Get more value from this coaching session by adding pre and post physical discomfort and training surveys. From these surveys and assessment completed during training, we build you a personalised action plan to reinforce key training concepts and provide additional recommendations to increase your comfort and further reduce the chance of injury. “You know…no one has ever showed me this before and I have been working in the industry all my life”. 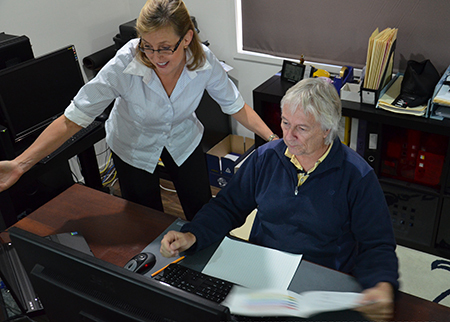 Want proven results from your Office Ergonomic and Injury Prevention Training?